To keep the enormity of what is happening in perspective, recall that Russia invaded Ukraine (where its aggression continues to date), annexed Crimea, downed the Malaysian flight MH17, continues to prop up the Assad regime, in spite of chemical attacks and the ongoing massacre of civilians, supports Hamas and Hezbolla, arms the Taliban, was linked to Novichok poisonings in the UK, mass disinformation campaigns, cyber attacks and election interference in the U.S. and Europe. After being sanctioned for their malign activities, the Russians scoffed at the sanctions. Putin’s Russia refused to do anything to acknowledge or remedy their ongoing malign activities. They’ve repeatedly reiterated that Trump is “theirs” (“Трамп наш,” which could have a twofold meaning: in a sense that the U.S. President is on their side, or in a sense that he is “owned” by the Russians), using that claim to build an expectation that Trump would either lift the sanctions or sabotage their implementation. #Russia's state TV: Alexander Losev, Member of the Presidium of the Russian Council on Foreign and Defense Policy, says that Trump had nothing to do w/ authoring #NSS2017, which was written 2 years ago. Female host: "Seemingly, Trump is ours again. So far, he's being quiet and not supporting the sanctions." #Russia's favorite part of the newly signed #sanctions bill. One year later, the Russian propaganda machine received a massive boost, when eight (8) American lawmakers (Senator John N. Kennedy (R-La. 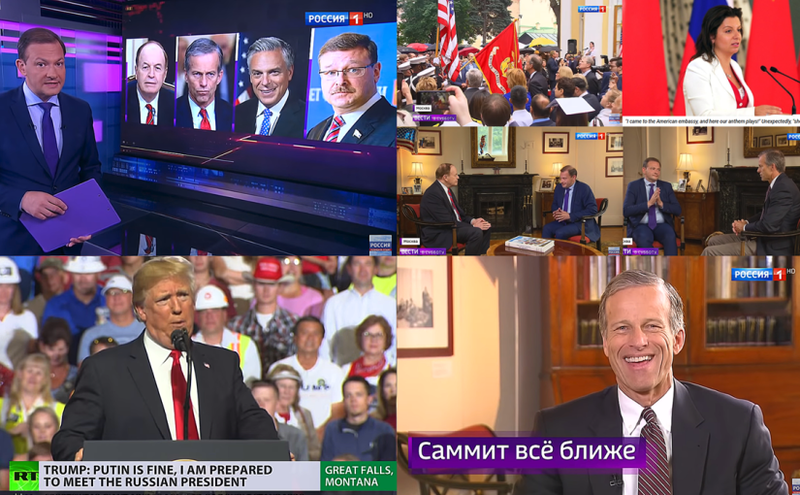 ), Senator Richard Shelby (R-Ala.), Senator Steve Daines (R-MT), Senator John Hoeven (R-ND), Senator John Thune (R-SD), Senator Jerry Moran (R-KS), Congresswoman Kay Granger (R-TX) and Senator Ron Johnson (R-WI)) traveled to Moscow, choosing to celebrate America’s independence in Russia over the 4th of July. Steve Daines was the only one who departed Russia early, in order to accompany President Trump on his flight to Montana. The Russians immediately announced that the very fact the delegation traveled to Russia, instead of isolating the Kremlin for its continued destructive behavior, constitutes a concession on the part of the United States – and Russia didn’t have to do a thing to earn it. MP Vyacheslav Nikonov (the grandson of Vyacheslav Molotov — Stalin’s protege and signatory on the 1939 pact with Nazi Germany) said that only 6 months ago, such a visit would be unconscionable. He added that in the recent past, U.S. lawmakers refused to communicate with their Russian counterparts even over Skype, as that would amount to political suicide. He gleefully added that it’s no longer the case, since Trump seems to have escaped Mueller’s trap and is renewing his plight to engage in dialogue with Russia. Kremlin propagandists seized upon the opportunity to point out that the U.S. – not Russia – was initiating the conciliatory efforts. Putin’s state TV ridiculed the lawmakers’ claim they were coming to examine the impact of the U.S. sanctions on the Russian economy. State Duma Deputy Leonid Kalashnikov mockingly asked: “Were they going to do that from St. Petersburg? Maybe from the Hermitage or the Red Square?” Kalashnikov said that the sanctions were wrecking the Russian economy, but not in any of the places visited by the U.S. lawmakers during their brief stay. Chairman of Foreign Affairs Committee Konstantin Kosachev said that none of the 4th of July visitors professionally deal with Russia and therefore, he had “to conduct a literacy campaign” to deliver some rudimentary knowledge to the U.S. Senators and Congresswoman. This provided yet another boon for Russian propaganda, reinforcing the recurring theme of “stupid Americans” that has been prevalent in the Russian state media and political circles for decades. #Russia's state TV: Politician says most U.S. Senators/Congressmen— like majority of their voters —have never been out of the country, couldn't find Ukraine on a map. Host asks: "Is it just a gathering of idiots?" The Russians speculated that Trump’s hands were finally untied in his dealings with Russia, since he is feeling invincible with respect to the outcome of the Mueller investigation. Chairman of Foreign Affairs Comm Konstantin Kosachev says that Trump is convinced that Mueller can't catch him — only #Manafort. Female host specifies: "He'll recognize Crimea as Russian and improve relations with Russia. That's what we're hoping for." The Russians rejoice, as the isolation seems to be over. Trump’s commentary about Crimea reinforced the Kremlin’s belief that the annexation would be accepted by the U.S. Participants discuss @BuzzFeed report that Trump told G7 leaders "Crimea is Russian, because everyone who lives there speaks Russian." They interpret it as Trump's recognition of Crimea's status. According to the Russian state media, not only would there be no need for the Kremlin to concede anything, but the U.S. could be treated as the genuflecting party that “wants something” and therefore will have to make concessions. Russian state TV reiterated that the U.S. lawmakers were in Russia to enable Trump to make deals with Russia and to lift the sanctions. U.S. lawmakers played right into the hands of the Russians, when they disallowed the press into the room where the bulk of discussions was taking place. Hold a meeting w/ GOP lawmakers in a secret room, exclude the press. Say Crimea was never mentioned. Have Sergey Kislyak (described by U.S. intelligence officials as a top spy and recruiter of spies) say there was no conspiracy. U.S. lawmakers further undermined their own credibility when they sat down to be interviewed by the Russian state media on the 4th of July. Senators Shelby and Thune claimed that Russia is America’s competitor, as opposed to adversary. Even the Russian host felt the need to correct that mistaken notion. Having emerged from their Independence Day pilgrimage to Moscow, U.S. lawmakers are claiming that they’ve delivered a strong message to the Russians. On the other hand, the Russians say the lawmakers changed their rhetoric and “quieted down” while interfacing with their Russian counterparts. The U.S. lawmakers claim they brought up the Crimea, while the Russians allege that Crimea was never mentioned. The lawmakers say Syria was discussed, but the Russians say the American’s have no clue as to what they even want with respect to Syria. The lawmakers assert they brought up the topic of Ukraine, the Russians claim they privately complained about being bored with Ukraine and feeling tired of the Ukrainian lobbyists constantly asking for money. Russian lawmakers and the state media are clearly seizing the opportunity to insert blatant disinformation into the information vacuum that was created by private meetings, without any members of the press or official records of the exchanges. For example, Crimea was discussed and the talking points about “everyone being tired of Ukraine,” because it’s constantly “asking for money” are merely a repetition of common propaganda narratives, frequently reiterated by the Russian state media. The assertion that the visiting lawmakers privately voiced such “complaints” is preposterous. Obvious falsehoods by Russian politicians and state media notwithstanding, by disallowing the press or a notetaker to document the precise content of exchanges with their Russian counterparts, the U.S. lawmakers enabled the Kremlin to control the narrative – not to mention, presented themselves as patsies for bad optics aplenty. Senator Ron Johnson said that he is open to revisiting the sanctions against Russia, since they aren’t “really working all that well.” A note to the Senator: if the sanctions weren’t working, the Kremlin wouldn’t be so desperate to have them removed by hook or by crook. The Russian propaganda machine is relishing another upcoming gift: Trump’s much-anticipated tête-à-tête with Putin. Part of the summit will exclude aides and advisors, allowing the Russians to speculate that “secret verbal deals” will be made. Just as with the U.S. lawmakers, lack of transparency will be aggressively exploited by the Kremlin for its agitprop. While the deal itself is unlikely to be earth-shattering, the vacuum of a closed meeting will be surrounded by speculation and promptly populated with Russian disinformation. The lack of transparency inevitably provides the opportunity for the Kremlin to fill every nook and cranny with misrepresentations, exaggerations and outright lies. 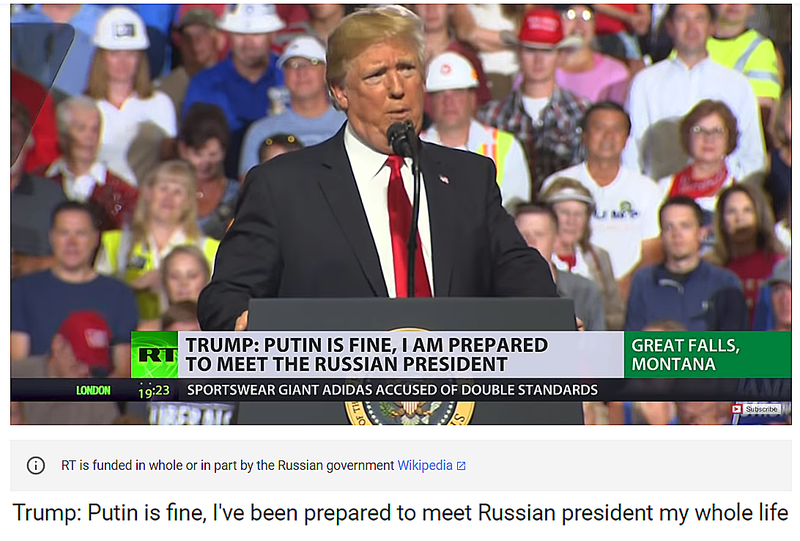 The Russian propaganda machinery is revving up to do just that on the eve of the Trump-Putin summit.